Whether you love a leisurely ride or a real off-road adventure, find a type of biking that appeals to your family. 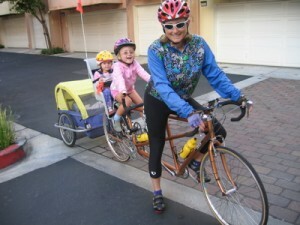 Here are 6 practical tips to get kids started with family-friendly biking. Over the summer, kids will be tempted to spend hours glued to electronic devices. Instead, why not encourage them to go out for a ride? With many benefits for the body and mind, biking is a healthy outdoor activity that can be done at almost any age. Looking to try it out? Here’s expert advice on sizing, types, gear, classes, and specialized activities like mountain biking. The most important step is to measure your child’s Inseam. A bicycle inseam (or leg length) is not the same as a clothing inseam. To measure, grab a book and a tape measurer. The child should stand with her back against a wall, spreading her feet about 6 inches apart, either barefoot or in socks. Place a book between her legs, close to the crotch to mimic the bike seat. Measure from the top of the book (that is, the spine) down to the floor. Choosing a slightly larger bike is fine in order to leave a little room to grow into. Avoid choosing a size which is too far off the mark for your child, which would impede his ability to learn correct riding habits and even expose him to greater danger. Depending on your interests, there are three main styles of bike: road, mountain, and “hybrid” (a blend between the two), depending on your interests. If you’re interested in mountain biking, according to MountainBikeReviewed, you can easily find and buy sturdy bikes for less than $300, like the Mongoose Statis Comp, the Villano Blackjack 2.0 or the Schwinn High Timber. Other great mountain bike brands which are geared towards kids are Spawn, Cleary, Early Rider, Pello and Stampede. Many mountain bikes are, contrary to opinion, quite cost-effective. For road bikes, your local bike shop should have recommendations. Online retailers like Amazon will often have many customer reviews posted. There are also online outfits like BikeExchange if you prefer doing research online. No matter what style you go with, when the child stands over the bike, there should be a 1-2 “ space between the crotch and the top bar of the bike. Also, “a beginner should be able to plant both feet flat on the ground when getting off the bike, which ensures safety and helps with confidence,” recommends Nick Pavlakis of Pedalheads. Pedalheads is a learn-to-ride bike camp based in Seattle, Portland, Denver and Chicago that offers both half-day and all-day camp options. These are rough approximations and, since every child is unique, you should use these numbers only as a guide. A good helmet which protects the brain is the single most important safety feature you must have. Make sure it fits, covers the entirety of the forehead and is properly ventilated. According to Pavlakis of Pedalheads, “research shows that up to 90% of fatal bicycle crashes result from head trauma,” so using a properly fitted and certified helmet will protect the head and brain from damage, which might save your child’s life. Note that helmets are mandatory for children under the age of 16 in most areas. “Check that there is no more than a two-finger gap between your eyebrows and the front part of the helmet,” advises Pavlakis. Layer up with season-appropriate clothing. In summer, light clothing with good arm and leg coverage will protect from sun, and in cooler temperatures, don’t forget gloves, warm socks, and a wind-proof shell. For urban and suburban biking, invest in a solid bicycle lock. If you want to take the whole family along but have younger children who aren’t yet able to pedal on their own steam, the most common options are: Trailers (a wheeled carriage which attaches in back of a bicycle), Pedal-less Bikes (also called Balance Bikes, where kids push off the ground to move forward), and Trail-a-Bikes (a seat plus single-wheel that attaches to a bicycle, allowing pedaling without steering capabilities). Good speed control and adapting it in accordance with the terrain. After mastering these basics, group classes are a great way for kids to learn important skills like giving hand signals, negotiating hilly terrain, understanding road signs and dangers, following traffic flow, and practicing proper spacing between riders. As a side note, older kids will benefit from learning some everyday maintenance routines, like checking the bike tire’s air pressure, putting the chain back together, and testing the brakes, often covered in more advanced classes or camps. 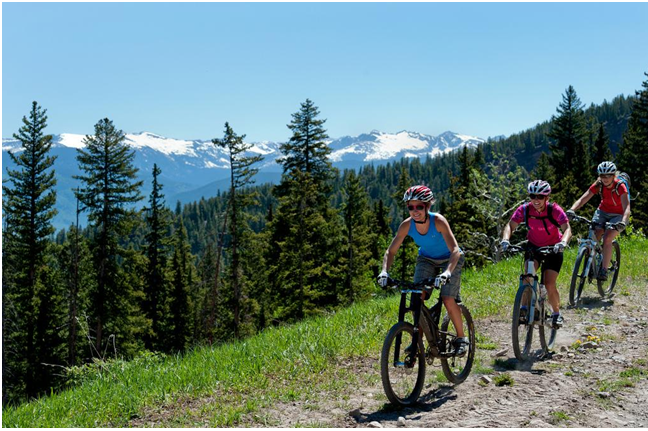 Mountain biking is a sport that is growing rapidly in popularity by offering excitement, challenge, and unique outdoor settings. To get kids started with mountain biking, you should remember that at the outset, your child might not have the physical endurance or the attention span needed to finish a certain route. Try increasing trip difficulty and length gradually to make the learning process smoother. First, make sure your child is very capable and comfortable traversing flat, easy terrain. Then transition to doubletrack dirt trails with varying degrees of difficulty and topography. Plan ahead to reduce the chance of accidents. Initially choose short, fun routes that you know well and that you feel your kid can complete with relative ease. Have fun increasing the level of difficulty over time! Pavlakis recommends that beginning bikers “maintain focus and awareness at all times,” of the conditions on their road or trail to reinforce safe habits. Biking is a perfect way to leave behind the distractedness of everyday life and be more fully engaged in the present. Have fun! On a roll? Check updated schedules and reviews of popular biking camps and classes in your area on ActivityHero. Amanda Wilks is a writer, veteran MTB rider and sports advocate. Her passion for mountain biking dates back to her childhood, when she would join her dad every weekend for a quick ride uphill. She is now addicted to the sport and she never misses a trail. Learn more about Amanda on Twitter.